In the past 114 years the Berkshire Museum has acquired an eclectic mix of 40,000 objects. Starting in November, 40 fine arts pieces will be sold in a series of auctions at Sotheby’s. The pro and con of this sale has been debated since plans were announced in the late summer by director Van Shields and the board of directors. Through violation of museum ethics it is now a pariah. It recently severed ties with the Smithsonian Museums. The build out has been estimated at some $20 million. The façade remains and behind it the historic Crane Room will be gutted to create a light filled atrium. The norm for such an ambitious project is to initiate bids from established architects. Recently, the world renowned architect, Frank Gehry, visited North Adams to discuss his "vision" for a model train museum and renovation of the Mohawk Theatre among 11 projects put forward by former Guggenheim Museum director, Tom Krens. By contrast it appears that Shields and the board consulted the yellow pages to come up with architects and designers. To the surprise of professionals the museum has opted for a local and relatively unknown design team. The Pittsfield based architecture firm Arcade and Dalton-based Hill Engineers, Architects, Planners Inc. were asked to develop renovation plans. New exhibitions and other museum elements will be created in partnership with Boston-based Experience Design. The 40 works being sold by the Berkshire Museum represent 1.67 percent of its 2,395 fine art pieces. That collection includes 440 paintings, 277 works on paper, 248 Asian works and 91 sculptures, which are the types of artwork headed for auction. What will become of the remaining works? “The executive director of the Berkshire Museum began to speak of 'monetizing' the institution's art holdings soon after arriving in 2011, according to a former collections manager.” The Eagle reported. "He'd ask, 'Why do we need all these Japanese block prints?' …"Van came in and started talking about monetizing the collection. I heard it from him the whole time…"
“Hayden said Shields contacted her last year and asked that she return to Pittsfield to help the Berkshire Museum review its holdings so it could decide what to sell. "He said he would make it worth my while financially," she posted on Facebook, speaking of that invitation. "They didn't have a Collections Manager at the time. He talked again about monetizing the collection and deaccessioning. I considered helping them for a moment because I thought I could steer the discussion. “She closes, "But I just want it to be clear, he always had the intention to 'monetize the collection;' he talked about it a lot." There are those are those who support Shields. This includes a board primarily of business leaders, Joe Thompson, the director of MASS MoCA, educators, politicians, children, and the region's parents. Of these, with the exception of Thompson, none appear to know much about the fine arts or the administration of museums. Numerous museum professionals take a different approach. There have been many such reports. Lynn Villency Cohen chairs the Collections Committee at the Stamford Museum & Nature Center where she has been a member of the Board of Directors since 2002. She wrote an op-ed piece for the Berkshire Eagle. “A critical component set forth in deaccession guidelines is that all deaccessioning decisions must be fully documented by the Curator of Collections, including a record on the cause for deaccessioning, method chosen and authority for deaccessioning. As first line custodians of art collections, it is the curator who will typically initiate deaccessioning discussions for reasons such as extreme deterioration, authenticity issues, or that the work has little monetary value. The curator will inform the museum's executive director in writing of the specific deaccessioning considerations. Initial reports on the decision to sell key works, reboot and shape A New Vision for the museum were mostly met with applause. The Eagle offered an endorsing editorial. Community leaders were pleased and many remain so. Passions have run high on both sides of the argument. 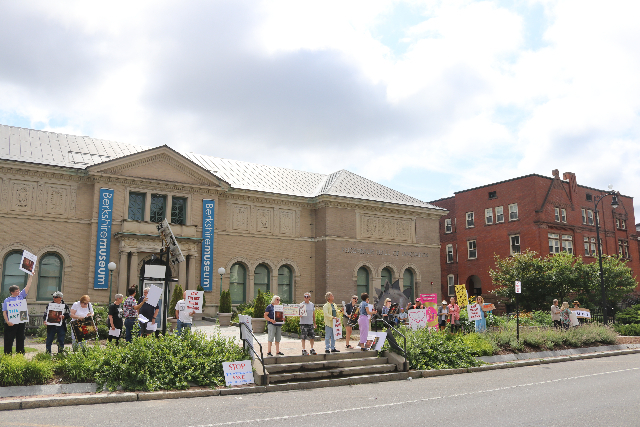 The local issue catapulted into national and global media because more than the future of the Berkshire Museum is on the line. It has become a closely watched case study that may impact the future of museum collections. What is being questioned is the legal basis for enforcing matters of ethics. "There is no greater flashpoint — real or imagined — in the relationship between trustees and museum professionals than the monetizing of the collection, defined as the use of the proceeds of deaccessioning for purposes other than the collection and its care, or, even worse, deaccessioning to raise money for operations or other institutional expenses." Gold challenges the legal strength of ethical principles. "The unwillingness of the museum community to recognize the legal right of museums to monetize their collections lies not just in the misconception that the ethical rule has somehow acquired the status of law, but, more importantly, is encumbered by a failure to appreciate the legal obligation and prerogatives of the governing boards of museums — the trustees..
“Since the proceeds are otherwise unrestricted as to use, if the trustees were to apply those proceeds to fund operating or capital expenses for the museum, all in support of its articulated mission, they would unquestionably be within their legal right to do so. "Indeed, one might speculate that at some point, if conditions became dire, they would be violating their fiduciary duties to the institution by declining to do so," he said. It has been reported that the sale us under review by the Attorney General. With the November sale fast approaching no legal action has been initiated. As many potential donors have found to their dismay you can’t just give things to museums. It’s not like clearing out the house and dropping things off at a more upscale Goodwill. Museums have collections committees which entails board approval. It takes considerable resources to conserve, store and restore objects. It is particularly difficult to fundraise for conservation when the vast majority of objects are not on display. Some 40,000 objects, many old and fragile, represent an enormous challenge and commitment. For the past two years nobody has been minding the store. When the museum was founded 114 years ago it was modeled on London’s South Kensington Museum which was called the Manufacturer’s Museum when it opened in 1852. In 1899 it was renamed the Victoria and Albert Museum. On that occasion the elderly Queen Victoria stated “I trust that it will remain for ages a Monument of discerning Liberality and a Source of Refinement and Progress." Today the V&A houses 4.5 million objects. It displays 2,278,183 items in 145 galleries. While eccentric and eclectic through leadership, vision and imagination it has remained engaged with visitors. Then, and until recently, the V&A has been an inspiration for the Berkshire Museum. During the founding generations of the Berkshire Museum trustees often donated not just fine arts but curiosities from European and world travel. The former director Stuart Chase, who left in 2010, told me of setting aside time to explore the collection. I asked him how he felt about being in charge of a “mongrel” museum with its taxidermy, butterflies, plaster casts of sculpture, and Hudson River paintings? “It’s what I love about it” was his surprising and enthusiastic response. Chase has not responded to requests for comments on the museum. We would like to know more about the depth and range of the collections. Is there an inventory? How might a scholar learn about objects and gain access to them for research and exhibitions? One such scholar is Professor David Owen of Cornell University. He has traveled to many museums to research and publish cuneiform inscriptions on fragile clay tablets. In some instances he has arranged to have the objects fired to preserve them. Through an artist I learned that he had visited the Berkshire Museum and inquired about the experience. He responded in e mails. He replied to a follow up question. With its New Vision just what is meant by the Berkshires? A primary focus for the fine arts has been on American art, including indigenous art and artifacts, genre, landscape, and regionalism. The two Rockwell paintings were exemplars of that approach. In recent years the museum acquired works by major Berkshire artists including Stephen Hannock, and Gregory Crewdson. The upcoming retrospecive by Morgan Bulkeley will include a painting from the permanent collection. This is not the first instance of deaccessioning by the museum. In November 2008, three works by Russian painter Boris Dmitrievich Grigoriev were sold at auction. They were unearthed when Chase was taking inventory and fell outside his definition of “Berkshires.” They sold for $7 million creating funds earmarked to enhance the collection. Money was invested in climate control which is essential to conservation. What remains of the fund and its potential restrictions has not been reported. Has it been merged into the $8.6 million endowment? The museum has not revealed if any of that endowment, from which it has been drawing down to cover annual losses, is restricted. Former Berkshire Museum director, Laura Bragg, sold "Raftsman Playing Cards" a masterpiece of 19th century genre painting by George Caleb Bingham, in 1934. More than 20 paintings were sold under Bragg for a total of $1,650, according to a report published Feb. 11, 1935 in The Eagle. Key works in focused collections are a magnet for donors. Patrons give works to museums with the understanding that they will be seen and appreciated. Former Whitney Museum of American Art curator, Patricia Hills, provided an example of how that works. "Years ago, I think in the mid-1970s, one of the Whitney Museum’s patrons had a fishing scene by the 19th century painter Jerome Thompson. My boss at the time wanted me to help the patron find a home for it. I had been to the Berkshire Art Museum before, so I recommended it to him. The director or curator was delighted, because the picture showed fishing in a mountain stream. I believe I actually delivered the painting myself, but that’s probably a false memory. Both the patron and I felt good that an excellent painting had found a good home," Hills stated by e mail. Chase and I shared an interest in Native American Art. There were artists we both knew and worked with. Before coming to Pittsfield he had been the director of the Rockwell Museum of Western Art, in Corning, New York. He hired a then young curator, Kathleen Ash Milby, of the National Museum of the American Indian, to study its collection of artifacts. There is depth of this material in the Berkshire Museum. It was included in exhibitions that Chase oversaw. I called Ash Milby and asked if she was familiar with the collection of the Berkshire Museum? She has no direct knowledge of the museum. She is an employee of the Smithsonian which oversees the museums in New York and Washington, D.C. Her curatorial expertise would be crucial when and if the Berkshire Museum opts to deaccession or monetize Native American artifacts. As reported by the New York Times that is precisely what is happening at other museums. “A noted collection of more than 150 Native American artifacts, including wampum belts and finely beaded ceremonial garb, will stay – for now — where it has been housed for almost 70 years, at the Peabody Essex Museum in Salem, Mass., officials announced Thursday. “The collection is owned by the Andover Newton Theological School, the country’s oldest seminary, but has long been housed at the museum. The school merged with Yale Divinity School which declined the collection. There is a significant link to issues that Shields faced in his former position as a museum director in South Carolina as reported in the Eagle. “(Sam) Thomas told The Eagle that Shields ordered him not to file a report containing information about Catawba settlements on the land, including evidence that the area contained a village whose residents might have been killed by a smallpox epidemic. “Thomas said he told Shields that the ethics of his profession, as well as state law, compelled him to file. He said he was instructed to go ahead and file, but not to keep a copy of the report. In advancing his “New Vision” for a museum, first a failed attempt in South Carolina, and now in Pittsfield, a pattern emerges. His strategies entail moral, ethical, cultural and legal conflicts.